Venezuela continues to be the target of an acute imperialist propaganda blitz. US Secretary of State Mike Pompeo directs foreign policy via Twitter, with provocative tweets including ‘What kind of a sick tyrant stops food from getting to hungry people? The images of burning trucks filled with aid are sickening’ (23 February) and ‘No food. No medicine. Now, no power. Next, no Maduro’ (7 March), providing headlines for tabloids and liberal media alike. Instantly re-tweetable images of burning aid trucks, humanitarian pop concerts and Venezuelans clutching candles and buckets dominate news feeds. True to Herman and Chomsky’s analysis1 the mass media is deployed as a weapon of mass deception. Manipulations, half-truths and outright lies manufacture consent for economic war and imperialist intervention in Venezuela. SAM McGILL reports. Below we republish a 29 January 2019 article from www.grayzoneproject.com by Dan Cohen and Max Blumenthal with the permission of the authors. Juan Guaidó is the product of a decade-long project overseen by Washington’s elite regime change trainers. While posing as a champion of democracy, he has spent years at the forefront of a violent campaign of destabilization. By Dan Cohen and Max Blumenthal. Otpor was supported by the National Endowment for Democracy, USAID, and Sharp’s Albert Einstein Institute. Sinisa Sikman, one of Otpor’s main trainers, once said the group even received direct CIA funding. Stratfor revealed that CANVAS “turned its attention to Venezuela” in 2005, after training opposition movements that led pro-NATO regime change operations across Eastern Europe. The “real work” began two years later, in 2007, when Guaidó graduated from Andrés Bello Catholic University of Caracas. He moved to Washington, DC to enroll in the Governance and Political Management Program at George Washington University, under the tutelage of Venezuelan economist Luis Enrique Berrizbeitia, one of the top Latin American neoliberal economists. Berrizbeitia is a former executive director of the International Monetary Fund (IMF) who spent more than a decade working in the Venezuelan energy sector, under the old oligarchic regime that was ousted by Chávez. That year, Guaidó helped lead anti-government rallies after the Venezuelan government declined to to renew the license of Radio Caracas Televisión (RCTV). This privately owned station played a leading role in the 2002 coup against Hugo Chávez. RCTV helped mobilize anti-government demonstrators, falsified information blaming government supporters for acts of violence carried out by opposition members, and banned pro-government reporting amid the coup. The role of RCTV and other oligarch-owned stations in driving the failed coup attempt was chronicled in the acclaimed documentary The Revolution Will Not Be Televised. The Stratfor and CANVAS trainers of this cell identified Guaidó’s ally – a libertarian political organizer named Yon Goicoechea – as a “key factor” in defeating the constitutional referendum. The following year, Goicochea was rewarded for his efforts with the Cato Institute’s Milton Friedman Prize for Advancing Liberty, along with a $500,000 prize, which he promptly invested into his political network. In November, 2010, according to emails obtained by Venezuelan security services and presented by former Justice Minister Miguel Rodríguez Torres, Guaidó, Goicoechea, and several other student activists attended a secret five-day training at a hotel dubbed “Fiesta Mexicana” hotel in Mexico. The sessions were run by Otpor, the Belgrade-based regime change trainers backed by the US government. The meeting had reportedly received the blessing of Otto Reich, a fanatically anti-Castro Cuban exile working in George W. Bush’s Department of State, and the right-wing former Colombian President Alvaro Uribe. Inside the meetings, the emails stated, Guaidó and his fellow activists hatched a plan to overthrow President Hugo Chavez by generating chaos through protracted spasms of street violence. Cedeño, for his part, is a fugitive Venezuelan businessman who claimed asylum in the United States, and Pedro Burelli a former JP Morgan executive and the former director of Venezuela’s national oil company, Petroleum of Venezuela (PDVSA). He left PDVSA in 1998 as Hugo Chavez took power and is on the advisory committee of Georgetown University’s Latin America Leadership Program. The alleged Fiesta Mexicana plot flowed into another destabilization plan revealed in a series of documents produced by the Venezuelan government. In May 2014, Caracas released documents detailing an assassination plot against President Nicolás Maduro. The leaks identified the anti-Chavez hardliner Maria Corina Machado – today the main asset of Sen. Marco Rubio – as a leader of the scheme. The founder of the National Endowment for Democracy-funded group, Sumate, Machado has functioned as an international liaison for the opposition, visiting President George W. Bush in 2005. In an televised appearance in 2016, Guaidó dismissed deaths resulting from guayas – a guarimba tactic involving stretching steel wire across a roadway in order to injure or kill motorcyclists – as a “myth.” His comments whitewashed a deadly tactic that had killed unarmed civilians like Santiago Pedroza and decapitated a man named Elvis Durán, among many others. Yon Goicoechea, the Koch Brothers posterboy, was arrested in 2016 by security forces who claimed they found found a kilo of explosives in his vehicle. In a New York Times op-ed, Goicoechea protested the charges as “trumped-up” and claimed he had been imprisoned simply for his “dream of a democratic society, free of Communism.” He was freed in November 2017. On January 21, a day before the coup began in earnest, Guaidó’s wife delivered a video address calling on the military to rise up against Maduro. Her performance was wooden and uninspiring, underscoring her husband’s political limits. The Revolutionary Communist Group unequivocally opposes the illegal attempts by the United States to foment a coup against the socialist government in Venezuela and its democratically elected president, Nicolas Maduro. This is the culmination of a process of destabilisation and violence to undermine a progressive government that has won 23 elections in 20 years and ploughed oil wealth into housing, health care and education. It represents the latest imperialist offensive in the war on socialism in Latin America. SAM McGILL reports. From Glasgow to Downing Street – Hands off Venezuela! The brazen attempt to overthrow Nicolas Maduro and the United Socialist Party in Venezuela intensifies. The US has now imposed an oil embargo, with the Treasury Department declaring all PDVSA assets under US jurisdiction blocked and US citizens and companies prohibited from engaging in transactions. Steve Mnuchin, Treasury secretary, indicated they will use all economic and diplomatic tools to support opposition leader Juan Guaido, who illegitimately swore himself in as president on 23 January. National security advisor John Bolton coldly calculated the move would cost Venezuela $11bn in exports in addition to $7bn of frozen assets. The Bank of England has reiterated its refusal to release $1.3bn of Venezuelan gold to the PSUV government. Instead, Guaido has written to Theresa May requesting the gold to be released to him. This is economic warfare, designed to suffocate the Bolivarian revolution, cutting off access to food, medicine and basic goods for the majority. Despite such heavy blows, the Bolivarian revolutionaries refuse to accept defeat. The armed forces remain loyal to the legacy of Hugo Chavez, the Bolivarian militias have been mobilising to defend against civil war and foreign intervention whilst the Bolivar and Zamora revolutionary current promote popular defence brigades ‘as a contribution for the social territorial organisation in the defence against fascism and imperialism’. No sanctions - No coup - Venezuela - we stand with you! Imperialist hands off Venezuela! Solidarity actions around the country today in Nottingham, London, Glasgow and Newcastle. We reject British support for the coup, we reject the biased media coverage of the BBC, Guardian and mainstream press. We demand the lifting of all British sanctions against Venezuela - the Bank of England must release the $1.3 billion of gold it is with-holding from Venezuela! Full solidarity statement here: Imperialist hands off Venezuela! Solidarity with the Bolivarian Revolution! On 4 August, Venezuelan President Nicolas Maduro survived a dramatic assassination attempt when two drones detonated explosives above him as he gave a televised speech in Caracas. Responsibility for the attack was claimed by ‘Operation Phoenix’, a group of renegade Venezuelan soldiers, but investigations indicate a shadowy network of right-wing actors in Colombia, Venezuela and Miami. Scarcely a month later, US Republican senator Marco Rubio called for US military intervention in Venezuela, while the New York Times exposed secret meetings between 11 US officials and coup-plotting Venezuelan officers. Luis Almagro, secretary of the US-aligned Organisation of American States (OAS), continued his crusade to isolate Venezuela, arguing ‘with regards to a military intervention aimed at overthrowing the regime of Nicolas Maduro…we should not exclude any option’. Such blatant disregard for sovereignty provoked a backlash across the region, but the US is punishing anyone stepping out of line, with Antigua and Barbuda, Dominica and St Vincent excluded from a US visa renewal waiver system after rejectingan OAS resolution against Venezuela. 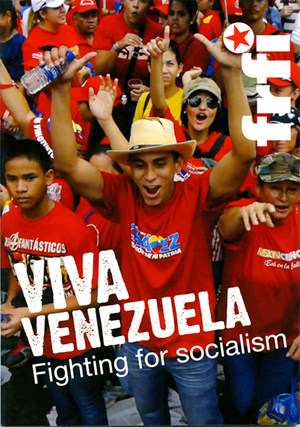 On 13 June 2018 the Revolutionary Communist Group, with Fight Racism Fight Imperialism (FRFI) SOAS student society and Rock Around The Blockade (RATB), hosted a public meeting titled 'Venezuela: How socialism can resolve the housing crisis' to explore the lessons that can be learned from Venezuela's Great Housing Mission and how they can be applied to the fight for social housing in Britain. Presentations were given by Marcos Garcia, First Secretary of the Venezuelan Embassy, and Hannah Caller of RCG and RATB. Below we publish the text of a speech delivered by Elias Haddad of FRFI SOAS, giving an overview of the Great Housing Mission and its wider context and lessons. In the most controversial presidential election to date, on 20 May Nicolas Maduro of the United Socialist Party of Venezuela (PSUV) was re-elected with 67% of the vote. In the face of sanctions, threats and international pressure to suspend the poll, that it still went ahead is testimony to the commitment of millions of Venezuelans to defending their democracy. However, turnout was at a record low of 46% (down from 80% in 2013), with nearly 12 million people abstaining. A boycott of the election was spearheaded by the opposition MUD coalition and directed by the US State Department as a pretext for further intervention. With a grave economic crisis, suffocating sanctions, and the resurgence of neoliberalism in the continent, the PSUV now faces a difficult task if it is to hold on to power and maintain the support of the working class. Sam McGill reports. The Revolutionary Communist Group expresses its condolences to the family, friends and comrades of Venezuelan community organiser and educator, Rafael Angulo Ruiz who died on 14 May 2018 at the age of 68. After demanding early presidential elections for the last two years, the US has announced it will refuse to recognise presidential elections scheduled for 20 May; its Venezuelan mouthpieces in the MUD opposition coalition will boycott the race. The MUD’s hypocrisy continues to cost it any legitimacy. Following its failed attempt to overthrow President Nicolas Maduro and the United Socialist Party (PSUV) through violent street protests that claimed over 100 lives in spring 2017, the MUD suffered a decisive defeat in October’s regional elections, winning only four governorships. Fearing further defeat, it boycotted December’s municipal elections, handing 92% of mayoralties to pro-government forces. Despite this, victory in the presidential elections is by no means guaranteed for current President Maduro, who only narrowly won 2013’s snap presidential elections following the death of Hugo Chavez. Henri Falcon, a dissident from both the PSUV and MUD, has registered his candidacy. Presenting himself as a moderate, he is winning a growing following. Presiding over an internal battle over democracy and facing an acute economic crisis, financial sabotage, currency fraud, rocketing inflation and US sanctions, Maduro has an uphill battle ahead. Sam McGill reports. 2018 will be a crucial year for Venezuela. Amid crippling economic sanctions, inconclusive peace talks, ever-pressing debt repayment deadlines and sky-high inflation, the nation will go to the polls in presidential elections, probably before the end of April. Sam Mcgill reports. The opposition MUD coalition is deeply divided. Extremists in the MUD led four months of violent street protests in 2017, leaving over 100 dead. Following the election of a constituent assembly, tasked with addressing the acute political and economic crisis, the violent protests fizzled out, failing to overthrow President Nicolas Maduro and the United Socialist Party (PSUV) government. October’s regional elections dealt the MUD a further blow, leaving the opposition with only four out of 23 state governorships. The Bolivarian revolution in Venezuela continues to defy press pundits and economic analysts alike. A convincing victory for socialist forces in the regional elections of October 2017 poured cold water on the chorus of critics predicting the collapse of the United Socialist Party (PSUV) government and has splintered the opposition ‘Democratic Unity’ (MUD) coalition into infighting and chaos. Meanwhile Venezuela is negotiating to restructure its debt, resisting US sanctions and an international economic campaign to force the nation to default. Inflation, economic sabotage and depreciation of the bolivar currency continue unabated. With municipal elections in December and presidential elections next year, securing finance and making progress against the economic war in the coming months is crucial. Sam McGill reports. In October’s elections, the PSUV-headed ‘Great Patriotic Pole’ coalition won governors in 18 out of Venezuela’s 23 states, garnering 52.7% of the vote with a 61% turnout. This shows a continuation of support for the Bolivarian project after July’s elections for the National Constituent Assembly saw eight million voters select delegates tasked with rewriting the constitution and tackling the economy. The MUD opposition received a major setback, losing two million votes compared to their significant victory in the 2015 National Assembly elections. The MUD still won five important states, including oil-rich Tachira and Zulia, which border Colombia, hotspots for opposition violence and para-militarism. However, the MUD lost Miranda state, which borders the capital and is the heartland of the Caracas elite, serving as a focal point for the violent opposition protests earlier this year. Venezuela’s Bolivarian Revolution is in the cross-hairs of a covert war. For the last 19 years, the struggle to build socialism has been under siege, facing coup attempts, street violence, foreign threats and interference. Imperialists and their allies in the opposition’s Democratic Unity (MUD) coalition will stop at nothing in their quest to overthrow the United Socialist Party (PSUV) government and destroy yet another nation attempting to control its natural resources and redistribute wealth. Insidious economic warfare is central to this strategy. The Venezuelan economist Pasqualina Curcio Curcio offers a gripping exposé of how this financial sabotage functions. In her book, The visible hand of the market,* she meticulously illustrates how headline-grabbing shortages and inflation have been manufactured. Sam McGill reports. Update, 5 August: Despite street violence and threats of intervention, Venezuela's Constituent Assembly elections saw over 8 million people cast their vote for candidates to rewrite the nation's Constitution. Given that the opposition boycotted the election, the 41% turnout demonstrates a high level of participation from the Chavista grassroots. It surpasses the 7.5 million votes for Maduro in the 2013 Presidential election and nearly totals the 8.1 million votes Chavez received for his final presidential stand. It also must be emphasised that this historic vote has taken place in the midst of ongoing opposition violence terrorising the streets. The night before the election, one of the candidates, Felix Pineda Marcano, a children's rights activist and community organiser, was assassinated. On the day, 200 polling stations were attacked by opposition thugs and nine people lost their lives during violent protests aimed at preventing the election from taking place. Inevitably, some were unable to reach the ballot box, yet socialists crossed rivers and burning barricades to reach polling stations, joining crowds of jubilant red-clad voters turning out to defend their Bolivarian revolutionary process. On Sunday 30 July, the Revolutionary Communist Group, Rock around the Blockade and Viva Venezuela, alongside supporters of the Bolivia Solidarity Campaign, Gran Polo Patriotico Venezuela, Marcha Patriotica UK, éirígí, the Italian Partito Comunista, and Venezuela Direct Action, stood in solidarity with the Bolivarian Revolution outside the Venezuelan embassy in Kensington. This was the day of the National Constituent Assembly elections in Venezuela, so it was vital that socialists mobilised to counter the lies that the imperialist media has spread about the election and the PSUV government. On Saturday 18 June 2017 the Revolutionary Communist Group and Rock Around The Blockade organised a picket of BBC Broadcasting House in central London to denounce its mendacious coverage of the struggle for socialism in Venezuela. Having picketed The Guardian for the same reason in May, the RCG and RATB targeted the BBC because this unashamed mouthpiece for imperialism spreads blatant lies about the Bolivarian Revolution in order to justify ongoing attempts at a fascistic counter-revolution. In May, a Venezuelan street vendor named Orlando Figuera was murdered by masked anti-government protesters in the affluent Altamira neighbourhood of East Caracas, the epicentre of right-wing violence. He was surrounded, beaten and stabbed before being doused in petrol and set alight. As a black, working-class Venezuelan, Figuera was representative of many of those enfranchised by the Bolivarian revolutionary movement. Other Afro-Venezuelans have also been singled out, burned and beaten to death. Fascist gangs have kidnapped and assassinated prominent trade unionists and community activists, whilst snipers have targeted socialist rallies. The gruesome attack on Figuera is a taste of what will come if the opposition overthrows the democratically-elected government of Nicolas Maduro and the United Socialist Party (PSUV). Sam McGill reports. The Revolutionary Communist Group stands in solidarity with the Bolivarian revolution in Venezuela! Defend the struggle for socialism against the US backed opposition whose violent protests have resulted in the deaths of over 42 people. - Supporters of Fight Racism! Fight Imperialism! Manchester held a Venezuela solidarity protest on 22 April against the growing threat of a Trump-backed coup against the socialist government. Passers by stopped to sign the petition and Palestine solidarity activists came to show support after a picket for the hunger striking prisoners in Israeli jails. Venezuela’s bourgeois opposition has once again taken to the streets in violent scenes of chaos and destruction with the aim of toppling President Maduro and the United Socialist Party (PSUV) government. Since 4 April several of its marches have ended with gangs of right-wing thugs setting up burning barricades and attacking public housing projects, hospitals, schools, health centres, transport systems and government offices. To date at least 31 people have been killed. The imperialist media and privately-owned Venezuelan press dishonestly portray these masked groups as ‘pro-democracy’ protesters facing down repression from the government; inevitably, they completely censor the mass mobilisations by working class supporters of the Bolivarian government. These lies, disseminated across the globe, are designed to provide the ideological framework for what is in reality a coordinated attempt at a right-wing coup. On 29 March the Venezuelan Supreme Court (TSJ) ruled that it had to assume Congress’s functions directly ‘to ensure the rule of law’ for an ‘interim period’. Contrary to the lies of CNN and other imperialist propaganda organs, this was not the ‘dissolution of Congress’. The ruling was made as a result of a serious impasse because legislation had been passed including the votes of three illegally-elected opposition MUD representatives, in contempt of the Supreme Court’s rulings. The Supreme Court decision provided an excuse for a storm of anti-socialist opinion in the Americas and caused disagreements in President Maduro’s Great Patriotic Pole alliance. On 31 March the President asked that the ruling be reconsidered, and it was subsequently withdrawn. Imperialist machinations against Venezuela’s Bolivarian Revolution have continued into Trump’s presidency. At the end of February a bill providing for stronger US action against Venezuela was unanimously passed by the US Senate and is now before Congress. The bill supports moves by the leader of the Organisation of American States (OAS) to invoke its so-called ‘democratic charter’ to suspend Venezuela’s membership and to justify further intervention, isolation and sanctions. Pushed by Senator Marco Rubio, a hard-line Cuban-American, the aim is to remove Venezuelan President Nicolas Maduro and the ruling United Socialist Party (PSUV) from office. Buoyed by US support, OAS Secretary General Luis Almagro issued a further ultimatum, demanding Venezuela hold immediate presidential elections or face suspension from the OAS. Presidential elections are not due until 2018 and the opposition’s attempt to launch a recall referendum last year was stalled by delays and fraudulent signatures. According to Venezuela’s constitution, now that Maduro has served over half his term, a recall referendum would only allow for the Vice President to complete the four-year term.Sam Mcgill reports. 2016 was a challenging year for the Bolivarian revolution. Since winning a majority in 2015’s National Assembly elections, the Democratic Unity (MUD) opposition has launched multiple attempts to overthrow United Socialist Party (PSUV) President Nicolas Maduro. These include attempting to nullify his election by claiming he is really Colombian; launching a recall referendum; manoeuvring to impeach him, and calling violent street protests. This has been accompanied by a campaign to isolate Venezuela internationally. Obama renewed a 2015 decree declaring Venezuela an ‘unusual and extraordinary threat to the national security and foreign policy of the United States’, attempted to expel Venezuela from the Organisation of American States and attacked the country’s participation in the Mercosur trade bloc. The past year saw crippling inflation and the depreciation of the bolivar currency, a slump in oil prices and devastating drought. Despite this the PSUV government allocated 73% of its budget to social expenditure, guaranteeing free health care and education, launching a network of local committees for direct distribution of subsidised food and built over 370,000 units of social housing. Sam McGill reports. Throughout November 2016, Venezuelan President Nicolas Maduro held successful talks with the country’s opposition coalition, in an encouraging sign for the future of the Bolivarian Revolution after a year of constant challenges to the socialist government. That the right-wing Democratic Unity Roundtable (MUD) agreed to negotiations at all is a triumph for President Maduro, who has for months called for a dialogue between the two sides, even accepting the opposition’s condition that the Vatican facilitate any such talks. Claire Wilkinson reports. This dialogue comes after a period of intense political conflict between Maduro’s United Socialist Party of Venezuela (PSUV) and the opposition coalition MUD. The opposition has controlled Venezuela’s National Assembly since it won a majority in December 2015. Its main objective since taking up its seats has been to oust President Maduro by any means possible. This has included massive electoral fraud committed while collecting signatures for the recall referendum, as well as rejecting the authority of both Venezuela’s Electoral Authority (CNE) and its Supreme Court, who have annulled decisions made by the National Assembly since opposition politicians began to attempt to change Venezuelan law in defiance of its constitution. 1. The right wing won a majority in the National Assembly in December 2015. 2. Its principal objective since taking its seats in Parliament has been to overthrow President Nicolás Maduro. The Non Aligned Movement (NAM), whose presidency Venezuela has just assumed, has rallied to defend the country against US-backed counter-revolution. With its 120 member states and commitment to self-determination, NAM exists as a counter to the imperialist-dominated United Nations, and is the world’s second largest international body. At its most recent summit in September, held on the Venezuelan island of Margarita, NAM rejected all imperialist intervention in Venezuela. It made it clear that, despite a crushing economic crisis and never-ending attempts to topple the country’s socialist PSUV government, the Bolivarian revolution continues to defend massive social gains in health, education, and housing whilst upholding the rights of oppressed people the world over. Sam Mcgill reports. September saw Caracas thronged with opposing white and red banners as the neo-liberal Democratic Unity (MUD) coalition pledged to ‘take the capital’, whilst Chavista socialists mobilised to oppose the threat of a coup. The protests have focused on the opposition’s efforts to hold a recall referendum to oust PSUV President Nicolas Maduro and force fresh presidential elections. The day before the largest demonstration, on 1 September, the authorities seized guns and explosives from opposition forces, dismantling a ‘paramilitary camp’ near the presidential palace of Miraflores. Some opposition protesters have since resorted to violence, burning cars, hurling Molotov cocktails and attacking police. Further protests are scheduled throughout October. Mass protests took place in Caracas against the assassination of pro-government figures following the murder of PSUV politician Robert Serra and his partner in 2014. Despite the daily bombardment of shock headlines predicting Venezuela’s imminent demise, the international media have remained conspicuously silent on the surge of political assassinations that have targeted Venezuelan revolutionaries and community activists. At least 13 pro-government activists have been murdered since 2014, not including any of the 43 dead in the violent ‘La Salida’ street barricades earlier that year. This is part of a sinister campaign of intimidation, calculated in cold blood that aims to overthrow the Bolivarian revolutionary movement. Meanwhile, tensions are building over the recall referendum against socialist President Nicolas Maduro, and the opposition’s economic sabotage continues. Sam Mcgill reports. Venezuela is in the grip of a massive showdown. The opposition-controlled national assembly is demanding Venezuela’s expulsion from the Organisation of American States (OAS); opposition leaders are clamouring for a coup whilst launching a recall referendum to topple President Maduro; the threat of foreign intervention escalates as imperialism turns the screw. Sensing an opportunity to overthrow yet another progressive state in South America, the imperialist press is ratcheting up its rhetoric. International headlines scream ‘chaos’ and ‘starvation’, reporting incessantly on queues and shortages, backing this latest destabilisation effort to the hilt. In the face of this imperialist onslaught, President Maduro, the United Socialist Party of Venezuela (PSUV) and the plethora of grassroots organisations that make up the Bolivarian revolutionary movement are pushing back, organising to take essential steps to tackle the economic and political crisis, mobilising the working class and poor to defend the gains made over the last 17 years. Venezuela’s right wing has restated its principal aim, vowing to oust socialist President Nicolas Maduro by July and roll back 17 years of the Bolivarian revolutionary process. To do so would return the country to the rampant neoliberalism and crushing poverty that dominated at the end of the last century. Their campaign continues to be underwritten by US imperialism. Sam Mcgill reports. On 8 March the opposition coalition, the Movement of Democratic Unity (MUD) published its ‘Roadmap for change’, a four-pronged campaign to overthrow Maduro and the socialist PSUV government. Jesus Torrealba, MUD’s executive secretary, declared: ‘We call on the entire Venezuelan people in order to force Maduro to resign as the President of the country’. The ‘Roadmap’ details plans to seek a constitutional amendment reducing the presidential term, launch a recall referendum, rewrite the constitution and mobilise on the streets. Meanwhile in March US President Obama restated his intent to destabilize the country, renewing a 2015 decree declaring Venezuela an ‘unusual and extraordinary threat to the national security and foreign policy of the United States’. The International Emergency Economic Powers Act (IEEPA) enables Obama to block transactions, freeze governmental assets and confiscate Venezuelan state property. Typically the IEEPA operates alongside increased covert and military interventions and media vilification. It has been used against Cuba, Iran, Syria and Russia. Following the electoral success of the right-wing opposition in December, when the MUD gained majority control over Venezuela’s National Assembly, US imperialism is ratcheting up support for the forces of counter-revolution. On 6 December 2015, the Bolivarian revolution suffered its greatest ever electoral defeat, losing 56% of the vote to the right-wing Roundtable of Democratic Unity (MUD) coalition. Over the last 17 years of socialist rule, the poverty index in Venezuela has dropped from 21% to 5.4% in 2015 – a record low. More than 36,000 people were lifted out of poverty in 2014 alone, despite an economic slowdown caused by economic sabotage and falling oil prices. 84% of retired people now receive pensions; free health care and education cover the whole population. A million units of social housing have been constructed. Now these extraordinary gains for the working class are under threat. Sam McGill reports. On 5 January 2016 the right-wing opposition took control of the National Assembly for the first time in 17 years. Its 109 seats, along with three pro-opposition indigenous representatives gave it a two-thirds ‘super-majority’ over Chavista forces, who had won only 55 seats. A two-thirds majority enables the right-wing to block spending on Venezuela’s extensive social missions, impose or remove ministers, dismiss the vice-president, call a constituent assembly to rewrite the constitution and initiate a process to remove President Nicolas Maduro. However, that majority was called into question by the fact that three of MUD’s representatives, from the state of Amazonas, have been suspended pending an inquiry into allegations of electoral fraud. Nonetheless, the new President of the National Assembly – the right-wing leader of Accion Democratica, Henry Ramos Allup – went ahead and swore the deputies in. He also ordered the removal of pictures of Hugo Chavez and independence leader Simon Bolivar from the chamber. In response, the deputies of the PSUV and its allies walked out, joining mass pro-Chavista protests on the streets outside. Venezuela's right-wing have a fight on their hands – all power to the communes!